Scroll down to see our selection of Bedside Commodes for sale. Bedsides commodes are often a necessity for both home care and health care facilities. We carry a large selection of bedside commodes to fit your needs. We have several different styles of bedside commodes, including 3 in 1 commodes, drop arm commodes, bedside toilets that fold and portable bedside commodes. Bedside commodes are a essential for many disabled persons, the elderly, or even just a convenience for those persons that may need a bedside commode temporarily during illness or an injury. Bedside commodes are a common common health care aid used for people with limited mobility. They consist of a frame, toilet seat, a back rest and pan underneath to catch the waste. Bedside commodes are a portable safe alternative and can be taken with you during travel or just about any application that you may need. They are used in the bedroom or patient room, they can also be used in the bathroom because it is easier to transfer to a bedside commode that it is to transfer to a standard toilet. Why do I need a bedside commode? Unfortunately the loss of control of the users bodily functions and the loss of mobility happen at the same time. This results in an embarrassing situation for the user and a lot of extra work for the caregiver. 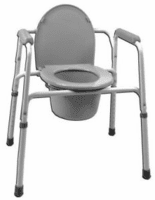 However if there is one of these portable commodes right next to the bed or tv chair there is a good chance the user can make it to the bedside commode in time..